Multiple shootings and multiple fatalities – this is how many of the initial breaking news captions emerged. An unprecedented shooting spree at two mosques in the city of Christchurch in New Zealand. “One of New Zealand’s darkest days” said New Zealand Prime Minister Jacinda Ardern. 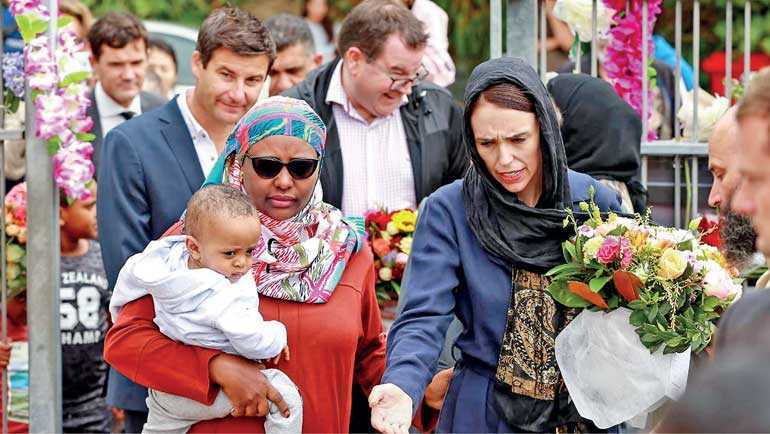 She described the attack as an “unprecedented act of violence.” Friday’s Christchurch terrorist attack killed at least 49 Muslim worshippers. The shooter Brenton Tarrant is a self-professed white supremacist, notably the second to derive ostensible inspiration from the toxic rhetoric of President Donald J. Trump’s pernicious demagoguery. Cross-sections of the far right seem to thrive on what is emanating from Trump Inc., the first being Alexandre Bissonnette in Quebec City, Canada. In his case the sentencing, Judge called Alexandre Bissonnette’s attack an ‘unspeakable tragedy’ that ‘tore apart our social fabric’. Brenton Tarrant had strapped a camera on his head and was live-streaming his brutal slaughter. An innovative way to spread far and wide the macabre, in a technologically well-connected epoch. In a 74-page manifesto he wanted “to show the invaders that our lands will never be their lands”. Our lands? Who were the natives of Australia? Who were the natives of New Zealand? Who were the natives of Canada? And most importantly who were the natives of the so called United States of America? Was it white people? Then who is the invader? What an imbecile? What stupendous ignorance? No wonder he’s such a studious disciple of Donald J. Trump. Similar language was articulated by the man who killed 11 people at a synagogue in Pittsburgh last October. At this rate, come 2020 for Donald J. Trump’s re-election, there could certainly be (God forbid) a couple of more blood baths. Trump is certainly a highly-adept political leader well-immersed in the unorthodox, gifted with the ability to arouse emotions, passions, and prejudices of the people. In his sensational manifesto, Brenton is supposed to have stated that he decided to give a future for his people. He describes his people as ethnically and culturally European. And he was determined to preserve and protect the European identity from multi-culturalism. He also lists the declining birth rates of the whites and strikes a foreboding of what could happen to the white race. What a load of crap. This can only come from a terrorist. Someone bereft of a sound education and possibly dysfunctional. Unfortunately many politicians the world over toe this dangerous line to further their political agenda. This allegation of disproportionate breeding levelled at Muslims is in essence a huge embarrassment to the non-Muslim world. Let’s face it. This is something quite important that has to be discussed and openly, which has been going on for some time now. Muslims cannot show Europeans how to increase their numbers. This is ridiculous and as stated becoming increasingly embarrassing. The only sensible advice this writer could afford is to stick to the natural man and women relationship strictly and with the idea of procreation. No other way will increase numbers, plain and simple. Since this terrorist has opened a can of worms, let’s go back in history and see first-hand the terrorism unleashed by the white man. The time has come to talk about this openly. What actual terrorists did? How they got their hands stained with blood after “completing the job”. Who are the natives of Australia? Indigenous Australians are the Aboriginal and Torres Strait Islander people of Australia. They are the natives of Australia. They descended from groups that existed in Australia and surrounding islands before British colonisation. So who invaded these people? Isn’t it the white man who did it? Who are the natives of New Zealand? The Maori are the native or indigenous Polynesian people of New Zealand (Aotearoa – The Long White Cloud). They arrived in New Zealand from eastern Polynesia in several waves at some time before 1300 CE. So who invaded these people? Isn’t it the white man who did it? Who are the natives of Canada? In Canada the First Nations, Métis and Inuit peoples are the natives. The original inhabitants of the land that is now known as Canada. So who invaded these people? Isn’t it the white man who did it? Who are the natives of United States of America? The list is endless. Some of the notable indigenous peoples of the Americas are the Yupik peoples, Aleut people, Alaskan Natives, Native Americans, First Nations, Métis, Indigenous Mexicans, the Caribbean, Central America, Arikara, North American Plains Indians of the Caddoan, Cherokee, North American Indians of Iroquoian lineage who constituted one of the largest politically integrated tribes at the time of European colonisation. Pawnee, Sioux, Apache, Eskimo, Comanche. So who invaded these people? Isn’t it the white man who did it? From the time European invaders arrived on American shores, the frontier – the edge territory between white man’s civilisation and the untamed natural world – became a shared space of vast, clashing differences that led the US government to authorise over 1,500 wars, attacks and raids on Indians, most of any country in the world against its indigenous people. This is the egregious legacy of the white man. By the close of the Indian Wars in the late 19th century, fewer than 238,000 indigenous people remained, a sharp decline from the estimated 5 million to 15 million living in North America when Columbus arrived in 1492. This is the horror, the sheer horror the white man instigated. This is well planned and well executed ethnic cleansing. And what the European invaders did to changing their natural way of life is another topic by itself. On a side note what jolted this writer was the name of the city in which this brutal massacre took place, Christchurch? A city, a cathedral distinctly associated with Christianity and more importantly Jesus son of Mary – (prince of peace). Christ an important term in the Christian vocabulary, references to ‘most holy’, ‘anointed’, ‘messiah’. Yet those worshipping their Lord, The Lord of Jesus son of Mary and the many hundreds of prophets and messengers sent to this world to proclaim His Oneness were senselessly and mercilessly butchered. The irony is quite puzzling and incomprehensible. History has it that the name ‘Christchurch’ was chosen in deference to the Canterbury Cathedral. Most New Zealanders still recognise Christchurch as the Cathedral City. This act of savagery is therefore an insult on the prophet of Islam Jesus son of Mary. It also unfortunately contributes to the never to be erased and negative immortalisation of the incident and the city. Clearly today one is confronted with many a distressing dilemma, negotiating, understanding outrageous ironies associated and stemming from benign names given to cities, countries, etc. Acts committed in them quite inappropriate to the name. One such example is the country of Israel which no doubt is notorious for its senseless killings of the Palestinians. The term Israel is genial and benignant as it refers to a prophet and a tribe near and dear to Jews, Christians and Muslims. Yet deception, invasion, extermination of the natives and their lands with the full support of European colonial masters have given an extremely bad name to these prophets and messengers sent by God. Prophet Jacob (Yakoob in Arabic) also known as Israel, one of a patriarchal line of prophets sent by God. When news headlines read like this: “Israel intentionally shoots and kills children”, little do they realise the insults, and irreparable damage they heap on another deeply loved prophet of Islam. Prophet Jacob, father of 12 sons and their dynasties later became known as the 12 tribes of Israel.